We can't see a flash... can you? The question over what camera will be gracing Nokia's Android handset, the Nokia X (aka Nokia Normandy), may have just been answered with a leaked photograph. Whilst the shot is wholly uninspiring - just a phone, monitor and can of Pepsi - it's the EXIF data that is proving to be a bit more revealing. If this really is the Nokia X (the data shows that the camera is the Nokia A110) then we're looking at a 5MP sensor having shot a photo with a 1920 x 2560 resolution. The codename Nokia A110 has appeared before, being spotted by Nokia Power User on AnTuTu as a handset running Android 4.4.1 KitKat with a 5MP camera so everything appears to tie together nicely. Interestingly though, the EXIF data shows (and image suggests) that the flash was fired. That might sound insignficant, but until now all of evleaks' leaked renders (like the one above) have omitted a flash. Recent leaked photos courtesy of Vizileaks did show a handset looking almost identical to those renders although if you look closely you can certainly see a little round flash sat next to the camera. 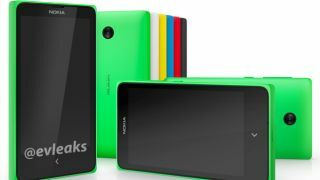 Reports of a Nokia RM-980 Android 4.1.2 handset have also appeared showing a phone with a 3MP (2048 x 1536) sensor. This is supposedly a dual-SIM variant of the Nokia X so perhaps we'll see multiple variants with different sensors. We'll have to wait until MWC to find out, but that's only a few days away now. Until then why not look at what we think the Nokia X should be? Via GSM Arena and Phone Arena.